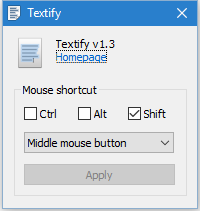 Textify is a free Windows utility that lets you easily copy a window's text, whatever the source. One of the great things about computers is they make it so easy to copy information. That’s why there’s nothing more infuriating than encountering a situation where you can’t copy what you need. Windows error pop-ups are a perfect example. Not only do they have inscrutable codes that are meaningless without a Google search, you often can’t copy them. Before you bother to take a screenshot or, heaven forbid, write down the error code with pen and paper, try out Textify. 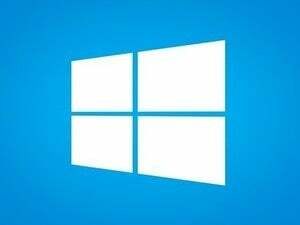 This free program for Windows is an easy-to-use utility that lets you copy text from areas on your display that weren’t designed with copying in mind. There’s really not much to it. You download Textify from the developer’s site in a ZIP folder, extract the EXE file, and run it. Textify doesn’t work like other Windows programs—the EXE file doesn’t install the program. Instead it acts as a launcher for Textify. So keep that file somewhere you’ll be able to find it, like your documents folder. Then when you need it, just double-click the file to launch the program. Once you’ve opened it, the only decision to make is what you want Textify’s shortcut to be. You can use the Ctrl, Alt, or Shift keys in combination with the right, left, or middle mouse button. By default, the key combination is Shift + middle mouse button, which works well. 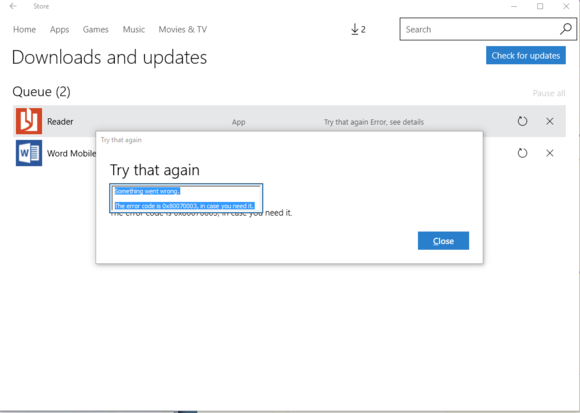 Textify in action on a Windows Store error window. Now go to the window with text you want to copy, hover over the text you need, click the shortcut, and if Textify is running, the contents will show up in a small window that looks like a text-editing box. Copy that text with a right-click of your mouse or Ctrl + C and you’re done. Textify works great for error screens, but does have some drawbacks. Its copy box can’t be enlarged. If you are trying to copy the entire contents of a window with a large amount of text split into sections, you will have to copy it line by line.